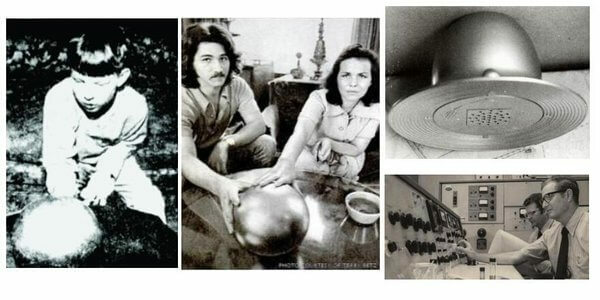 Home » BETZ MYSTERY SPHERE – AN ALIEN ARTIFACT FOUND BY A FAMILY? THIS IS A STRANGE AND UNUSUAL STORY OF THE BETZ MYSTERY SPHERE THAT COULD DEFY THE LAWS OF GRAVITY…BUT NO ONE KNEW WHAT IT WAS OR WHERE IT HAD CAME FROM. At first they thought it may have been cannonball given the areas history – but they soon realized by the highly polished metal surface of the seamless orb…this was something different. Seeing it as only a strange curiosity, the family decided to take it home with them and their son Terry, wanted to keep it in his room – but that did not last for too long. From what they had observed, the strange orb seemed to be powered by solar energy (even though solar energy was first discovered by Alexandre Edmond Becquerel in 1839, it was not in commonly used in 1974). They noticed that when the sun was shining brightly – the orb was more active. It is rumored that at night the Betz family would keep it in a sealed box – so that it would not escape. The Betz family were stunned at the sphere’s capabilities and started showing it to family and friends – they were equally shocked and it rapidly became an object of fascination. Word soon got around about the Betz Mystery Sphere and quickly it started a media frenzy – everyone wanted to know about this strange ball. Despite requests from officials to take the ball to a lab for testing, the Betz family refused…but soon they had no choice. Doors would suddenly slam shut of their own accord and at night the house would fill with loud organ music – despite the fact that the Betz family did not own an organ. This quickly became too much for the Betz family, so they agreed to allow the orb to be tested under scientific conditions – they wanted to know what this was? The navy eventually used a 300 KV x-ray and discovered 2 objects inside the sphere – surrounded by a halo of material with unusual density. They also discovered that the spheres displayed 4 magnetic poles, 2 positive and 2 negative which did not have the same center. It also showed signs of being radioactive but it was not explosive and one scientist (Dr Carl Wilson) was noted as saying that it“defies the law know to physics”. Another scientist (Dr J A Harder) is reported to have said that the elements inside were heavier than anything known to science. There have been people who have tried to debunk the Betz Mystery Sphere with many explanations ranging from: it was a lost steel ball that was meant to be used for an art project – to a sea bottom marker that somehow got into their burnt out field. Since that time, other orbs have been found on earth since 1974 that include from Australia, Russia, Iraq and America …but no one knows what they are or where they come from. Now over time no one talks anymore about The Betz Mystery Sphere – but where is it now? No one seems to know….and it has somehow disappeared from many people’s mind.